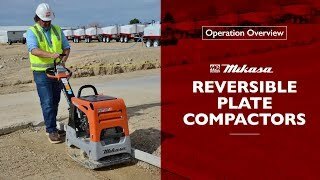 Multiquip’s Mikasa Reversible Plate Compactors are the ideal high-production machines for efficient compaction of sand, gravel and cohesive soils. Fold-out front cover for easy access to all maintenance points. Hour/Tachometer to measure machine hour usage and engine RPM. Cyclonic pre-cleaner to capture most airborne contaminants for engine protection and extended service life. Heavy duty shock mounts to withstand harsh operating environment while reducing vibration to the operator and helping to extend component life. Hydraulic controls enables operator to easily switch direction from forward to reverse while also allowing for spot compaction. Rugged base plate manufactured from high strength steel for top performance and featuring open design for easy cleanup. Steel frame protective guard with fully integrated cage protects the engine from loose debris or dirt while serving as a lifting bar for easy portability. Low profile base plate lowers the center of gravity dramatically improving travel speed. Watch this video to learn more about operating and maintaining your MQ Mikasa Reversible Plate Compactor, covering pre-operation inspection, starting procedure, and basic operation.